Even if you have to make a journey to the other end of the country, some gardens are worth the effort. The moment we arrived for the very first time at Spinners Nursery in Hampshire I knew that, despite the hellish car journey, the trip was going to have been worth it. The short walk up to the entrance of the garden and nursery sets your heart racing: long drifts of epimediums line the path, there are camellias I’ve never seen before underplanted with red-flowered trilliums, the creamy bracts of tall cornus hang over clumps of white erythroniums. And this is just the way in. That visit was nearly twenty years ago and the nursery quickly became one of my favourites. 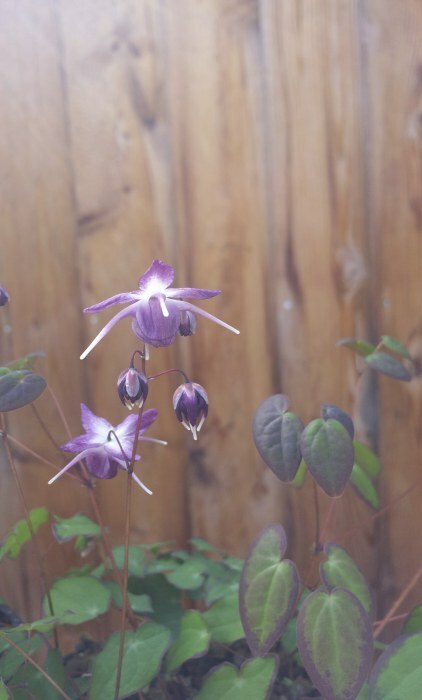 Many of their plants I couldn’t grow on my chalky soil: the trilliums, the magnolias, lots of the cornus I could only admire, but the epimediums, now those I could grow and bought lots. They are still growing in both Britain and France and right now, at the end of a long cold winter, the new fresh leaves are pushing through the black soil and down in the crown of the plant I can see flower stems waiting to push up and start singing. In the wild Epimediums are woodland plants that thrive in the dappled shade and leaf litter under deciduous trees. Some of the more robust species are perfect for growing in dry, shady places. The spread by think rhizomes that soon form dense mats, making great groundcover. In the early spring when the foliage first appears it is often burnished with gold or copper tones. The sprays of spider-like flowers appear shortly afterwards. These are not flamboyant or spectacular plants: they are hardworking, demure and beautiful, just the qualities I want in my garden. Until thirty years ago the number of species available to gardeners was limited to about a dozen but the opening up of remote parts of China, where many Epimediums are endemic, has meant that plant collectors have been able to introduce many more. 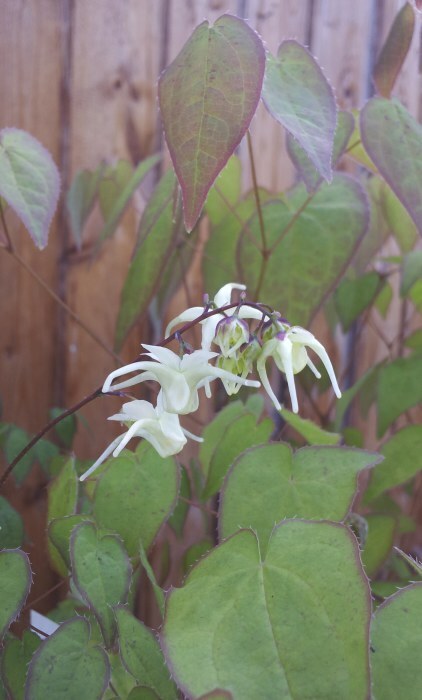 The first of the Chinese species I grew, Epimedium acuminatum, was introduced by plant collector Roy Lancaster in the 1980s. It has long-spurred purpleand white flowers and elongated leaves that have a slightly serrated edge. Plant breeders have seized the opportunity presented by and plant breeders are beginning to produce exciting new hybrids and cultivars. 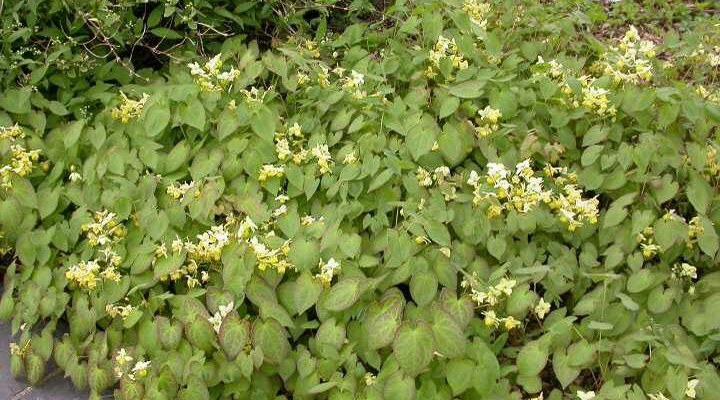 Desirable Plants at Totnes in Devon have bred a tough and vigorous hybrid called Epimedium ‘King Prawn’. Despite the awful name it is a beautiful plant, with attractive evergreen foliage and large pale sand-coloured flowers that are blushed with pink. (I know, put like that they don’t sound very appealing but they are). Even after just a couple of years it has formed a clump about 40cm (15in) tall. Much more demure is an introduction from Elizabeth Strangman, Epimedium grandiflorum that forms a neat dome about 15cm (6in) tall. The flowers are deep crimson and the new foliage is edged with a deep purple stain. 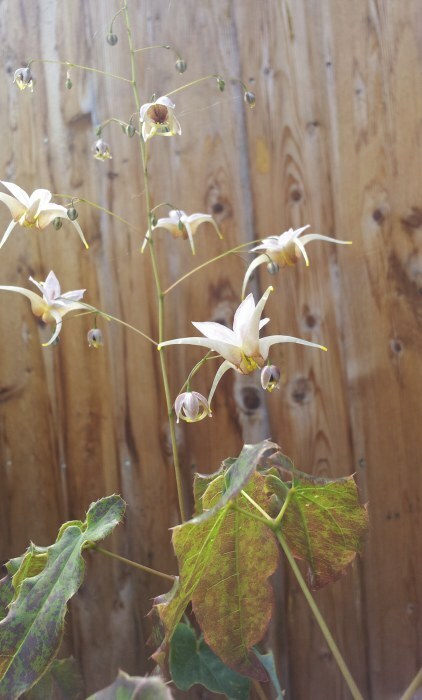 Epimediums prefer cool damp shade and humus rich soils but the more robust species such as Epimedium pinnatum, Epimedium grandiflorum and Epimedium x youngianum will thrive even in dry, shady situations. The Chinese species and their hybrids have a reputation for being difficult to grow but I have found that as long as the soil is rich but well drained they are as easy as their cousins.